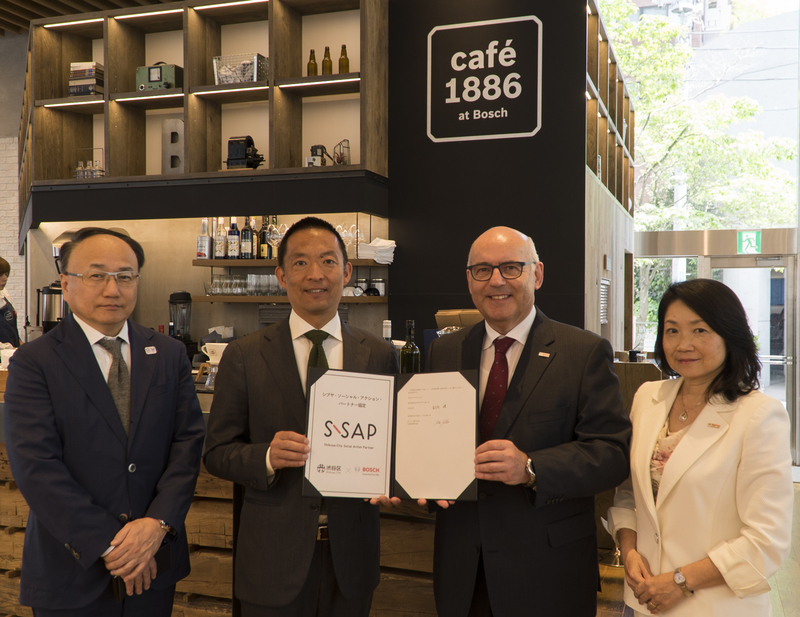 "Shibuya Social Action Partner Agreement"
Bosch Corporation and Shibuya city have concluded a "Shibuya Social Action Partner (S-SAP) Agreement" under which they will cooperate with the goal of solving issues facing the local community. Bosch Corporation is the first foreign-invested company to conclude such an agreement. Meetup events are to be held at café 1886 at Bosch, on the first floor of Bosch Japan's headquarters. The events will welcome guests related to Shibuya city in order to support "Neighborhood creation and local community activation" together with NPO greenz. Tokyo – Bosch Corporation (Shibuya, Tokyo), a member of the Bosch Group, a leading global supplier of technology and services and Shibuya City (Mayor: Ken Hasebe) concluded a "Shibuya Social Action Partner (S-SAP) Agreement," a comprehensive collaboration agreement aimed at resolving issues facing the local community through mutual cooperation, on May 8, 2017. Udo Wolz, President and Representative Director of Bosch Corporation, commented that "Bosch Japan has 106 years of history and associates from 38 countries are working at Bosch Japan right now. Diversity is one of our strengths. We are happy to contribute to society by collaborating with Shibuya city as a good corporate citizen." Mayor Ken Hasebe commented "Based on Bosch founder's spirit of "Voluntary Social Service", Bosch Corporation has conducted many Social Contribution Activities. We feel encouraged about having Bosch as our trusted partner. We look forward to collaborate in working together to resolve local social issues through activities focused on the district of Shibuya city in accordance to this agreement. " Under S-SAP agreement, Bosch and Shibuya city will cooperate on solving issues facing the local community in the following contents. ※The S-SAP agreement is promoted by Shibuya city since April 2016. 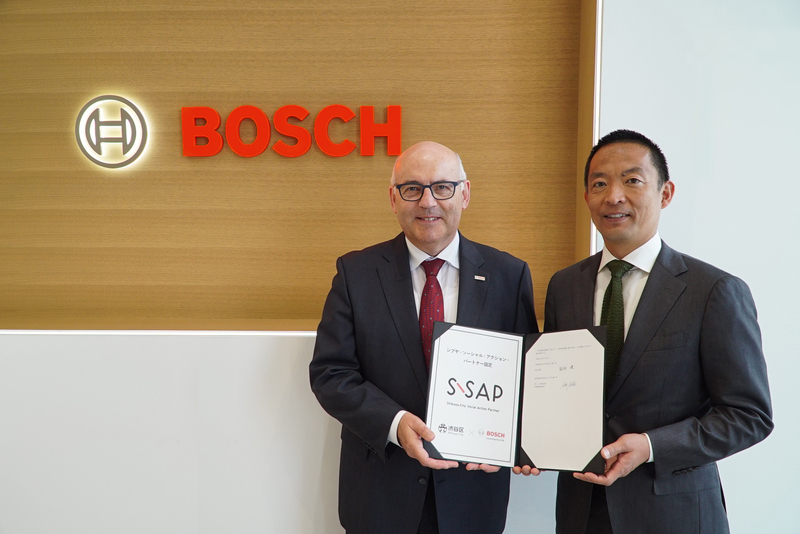 "Shibuya Social Action Partner (S-SAP) Agreement"
Shibuya City and Bosch will conclude this comprehensive agreement aiming to cooperate on solving issues facing the local community, agreeing on the basic items necessary to achieve this aim. As a first step, in order to support "Neighborhood Creation and Community Activation" as stated in 1) above, meetup events welcoming Shibuya related guests will be held with NPO greenz. Please join if you are working or interested in Shibuya. Name of event: "green drinks Shibuya"
Bosch Japan would like to contribute to the development of regional society in collaboration with Shibuya city, utilizing our strength of internationality and global business network. Bosch in Japan is currently represented in the country by Bosch Corporation, Bosch Rexroth Corporation, Bosch Packaging Technology K.K. and other affiliates. Bosch Corporation is responsible for the development, manufacturing, sales and services of automotive original equipment, automotive aftermarket products and power tools. Bosch Engineering K.K. provides engineering services, such as development and application for automotive systems. ETAS K.K. develops and provides engineering of development support tools of electrical control units. Bosch Rexroth Corporation develops and manufactures hydraulics, FA module components and other systems which contribute to industrial technologies. Bosch Packaging Technology K.K. provides processing, packaging and inspection technology. Bosch Security Systems Ltd. provides security and communication products and solutions to help secure the safety of lives, buildings and properties, and is also a supplier of professional sound systems. In 2015, Bosch Japan achieved sales to third party of some 270 billion yen and employed approximately 6,600 associates. The Bosch Group is a leading global supplier of technology and services. It employs roughly 390,000 associates worldwide (as of December 31, 2016). The company generated sales of 73.1 billion euros in 2016. Its operations are divided into four business sectors: Mobility Solutions, Industrial Technology, Consumer Goods, and Energy and Building Technology. As a leading IoT company, Bosch offers innovative solutions for smart homes, smart cities, connected mobility, and connected manufacturing. It uses its expertise in sensor technology, software, and services, as well as its own IoT cloud, to offer its customers connected, cross-domain solutions from a single source. The Bosch Group's strategic objective is to deliver innovations for a connected life. Bosch improves quality of life worldwide with products and services that are innovative and spark enthusiasm. In short, Bosch creates technology that is "Invented for life." The Bosch Group comprises Robert Bosch GmbH and its roughly 440 subsidiaries and regional companies in some 60 countries. Including sales and service partners, Bosch's global manufacturing and sales network covers nearly every country in the world. The basis for the company's future growth is its innovative strength. At 120 locations across the globe, Bosch employs some 59,000 associates in research and development. Additional information is available online at www.bosch.com, www.bosch-press.com, and twitter.com/BoschPresse.